Ladies and Gentlemen, dear friends of music, with this CD "Artist and Entertainment Berlin" would like to present you a great young artist: the singer Natascha Osterkorn´s voice will take you into a seemingly lost and past world where she will charm you by her uniquely sensuous creed. Please do follow this gifted singer wandering through time and tradition of Russian gipsies. Follow her on a journey through serene lightness, bottomless depth of soul and emotion, al longing for love and tenderness, the freedom of being boundless and eventually on through the experience of being treated unjustly Natascha Osterkorn sings about the joys and sufferings, about comic and tragic elements of gipsy life. With this CD we want to demonstrate our commitment to the ethnic groups generally known as "gipsys" and to their musical traditions which we would like to keep alive. Having left their original area in India during the 10th and 11th century they went a long way via Asia Minor, Greece and Turkey to Europe where from several tribes got to made for Southern Russia, for the nothern regions of the tsar realm and even for Scandinavia. Apart from their renowned abilities in music, dance and artistry gipsy families mostly lived on crafts, such as the blacksmith´s or the tinmaker´s. Occasionally Romanies were even warmly welcomed as they brought along new techniques of iron and metal processing. In 1774 the Earl of Orlow-Tschesmenski founded a choir of gipsy serfs that became famous all over Russia. In the wide repertoire of such gipsy choirs there were also folk-songs and romances written by well-known Russian composers. Along with an increasing musical professionalism it was particularly these romances that strongly influenced the further development of gipsy music. In many parts fo Europe, however, the Romanies´ different way of life and high mobility conflicted with the values and virtues of the majority. Prosecution and the attempted genocide during the period of German Nazism were the worst threats to the manifold forms of Romany cultures and ways of life. Up to the present day there are some who maintain scepticism or even rejection due to the Romanies´ specific temperament, their difficult languages and their unwillingness to concede to normative pressure exerted on them by the majorities in most European countries. Nevertheless, their musical culture is a somehow global mission in the drabness of mixing styles in our so-called modern world. 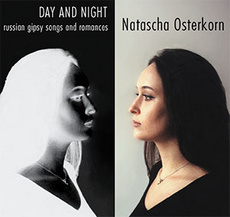 Enjoy the sensuousness of the moment and get pleasure and strength from what will happen inside you when listening to Natascha Osterkorn´s songs.